The mayor of Long Beach, California responds with support for our campaign against the South Korean dog and cat meat industry. 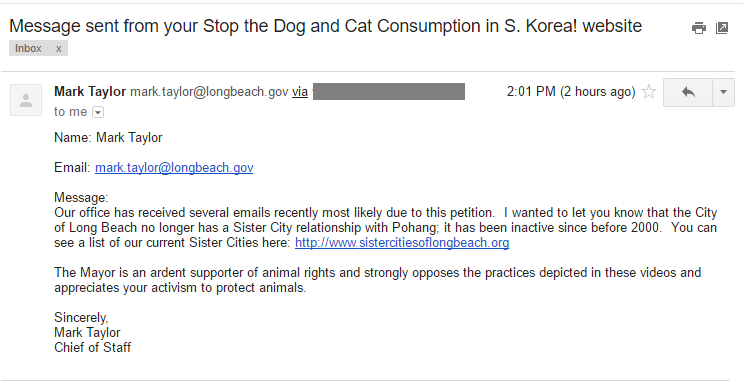 Home / Blog / The mayor of Long Beach, California responds with support for our campaign against the South Korean dog and cat meat industry. We have received a response from Mr. Mark Taylor, Chief of Staff for the Mayor Robert Garcia, in Long Beach, California regarding our campaign, asking them to take action over the dog-meat trade in Pohang in South Korea. We are grateful to the Mayor and his office for responding to our concern so quickly, and especially appreciate the Mayor for supporting animal rights and opposing cruelty in the South Korea’s dog and cat meat trade. I would like to thank you and the City of Long Beach for responding to our concerns raised via the recent petition on Change.org about the mistreatment, torture and consumption of companion animals in Pohang, South Korea. And thank you for informing us that Long Beach is no longer Sister City with Pohang. It is best not to be linked to a city which is notorious for their cruelty to companion animals. We have updated our supporters who have signed our petitions as well as our campaign page. Again, we thank you, and hope you will follow our efforts in changing the perception of dog and cat eating nations, like South Korea. We are a “grass roots”, hands-on group of people who dedicate ourselves to ending the cruelty and atrocities in the dog and cat meat trade. We continue to work, not for profit, but with love and compassion, for the Korean animals. Thank you so very much for expressing your compassion and respect and sensitivity toward the dogs and cats in the horrifically cruel meat trade in South Korea. My family and I are grateful that you are no longer Sister cities with such soulless, sinful, evil people. We appreciate your letter of support and hope that you can take a pro-active move by writing a letter telling Pohang that you strongly oppose their egregious cruelties to sentient beings. These companion animals are not only murdered in atrocious, gruesome ways, they are tortured before death because some Koreans believe that the more torture, the more tender the meat! Mr Taylor, how good it to hear it !! you are one of the so little people who express cleary their position against this horrendous trade !! it’s something appalled and archaic ! we are living in the 21 century and all this so-called “traditions” must be banned. Martin Luther King Jr said ” never, never be afraid to do what”s right, especially if the well-being of person or animal is at stake. Society’s punishments are small compared to the wounds we inflict on our soul when we book the other way” thank you ! and please ! help us to share and spread our fight !! Thank you most sincerely, Mr, Taylor. It’s heartening to know that, among the evil in the world there are some humane souls standing up for good. How wonderful that he is an animal advocate! Thank you sincerely for your response to the dog and cat meat trade in South Korea!